The Cube³ Ultra Urinal by Caroma™ is specially designed to meet industry needs wherever water savings are a vital component for a bathroom. Constructed of vitreous china, Caroma urinals offer contemporary designs for commercial and residential developments. 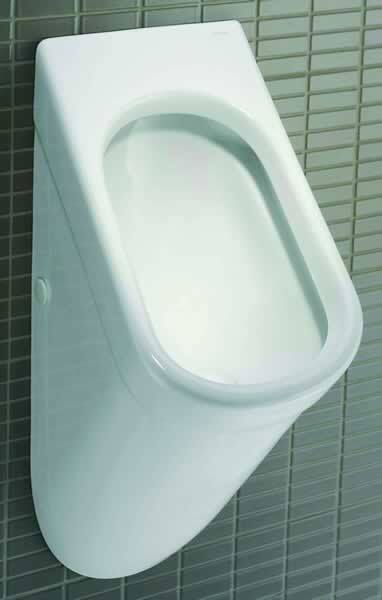 A contemporary design fully integrated box rim, wall mounted urinal operating with a ultra low flush of 0.13 gpf (0.5 liter). The system incorporates a fully automatic electronic smart demand ‘Urine Sensing’ urinal suite featuring hands-free operation to give a combination of superior features in optimum user hygiene, water-saving and vandal resistance. Cube3 Ultra combines the new smart demand flushing system with the Cube3 Ultra urinal ensuring optimal operational standards and efficiency. The sensor is concealed behind the urinal resulting in vandal resistant installation ideal for heavy-duty applications. The sensor device is factory fitted for ease of installation. View Cube³ Ultra Urinal specifications and Caroma urinals brochure. Contact us to inquire about volume discounts or if you find Caroma™ products available for less elsewhere online. WaterWise Technologies will match or beat any regular published price offered by other distributors. Purchase orders are accepted.